The most important decision you’ll ever make about your home, after you actually decide to own it, is how, when and if you renovate. As a self made pro at ‘flipping’ a house into my home, I’ve learned a thing or two in my almost dozen projects. These are the steadfast rules that have always held true for me and I hope you can find value also. The number one rule and the first thing to consider is something I learned from a rather odd source, comedic genius – Bernie Mac. Remember Bernie? His sitcom from the early 2000’s is something for the ages and I’m shocked I don’t see it in higher syndication rotation. One faithful afternoon while watching, he too was going through a renovation and he pulled out this helpful triangle. The thing about a triangle is that it’s impossible for all three corners to touch. In renovation terms, there are three things everyone wants – they want GOOD quality work, they want it FAST and they want it CHEAP – let me assure you, it is impossible to have all three. As he went on to explain, you can have it GOOD and CHEAP but it’s going to take forever. You can have it CHEAP and FAST but it’s going to be poor workmanship. 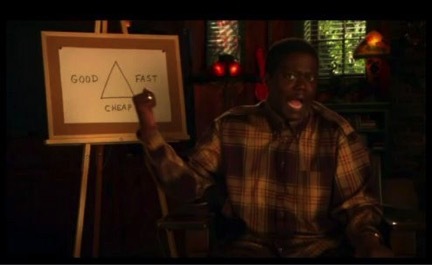 And finally, if you want to GOOD and FAST it ain’t gonna be cheap. The moral of this story is, decide what’s most important to you even before calling the contractor. For me, it’ always been CHEAP and GOOD, which means I have to wait for sub-contractors to have a free day, I’ve had to eat microwave meals for 16 weeks (that’s FOUR MONTHS) while my kitchen is gutted. Can you live with your water being shut off for hours or days? Do you have pets? It’s a nightmare having a dog outside or locked in another room all day. Living though a remodel is a lot harder than most people think, just ask my husband who’s lived through almost half a dozen in the last 12 months. The week we’ll start to explain why renovations always gets tougher than you expect.